Now as part of Live 10, there’s further improvement to how Link works between multiple applications and many Link-enabled instruments. So now’s a good time to look at some of the latest possibilities for playing with Link. There are now more than 150 applications with Link technology built in. Originally part of Live and a handful of iOS apps, Link has been adopted as a hassle-free music-making solution across multiple platforms, including Android, iOS, macOS and Windows software, as well as a number of hardware instruments. So what exactly are the possibilities now? To name a few, you can customise your Serato DJ set with beats, loops and effects from any Link-enabled product. Synchronize lights or visuals with your music. And run hardware like the MPC Live or Eurorack modules in parallel with any Link enabled music making application. Link’s new Start/Stop Sync feature brings improved control across Link-enabled products, both on a single device and across multiple devices. 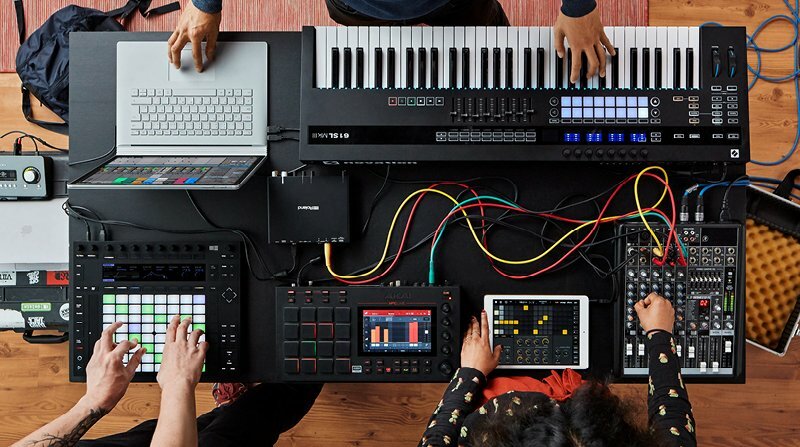 When playing with multiple devices using the first version of Link, any player can control the tempo, and individual players have control over when they start or stop their part. In the new version of Link, we’ve added the option to start or stop multiple applications together. So when playing alone or alongside others with several apps or devices, one application can control both the tempo and Start/Stop commands of all applications with the feature enabled.